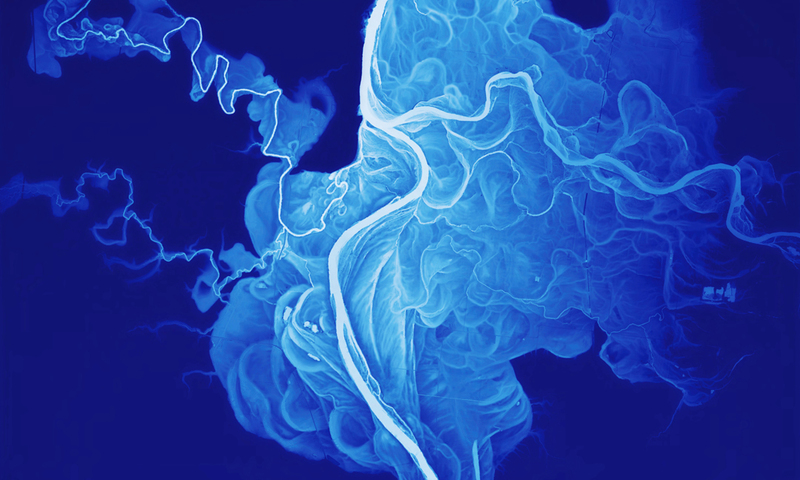 Project: This lidar image of the Willamette River was originally the result of visual experimentation with color ramps and lidar elevation ranges. The image is a digital elevation model of the Central Willamette Valley from Monmouth/Independence in the north to Albany in the south. The representative colors are compressed to a 50-foot elevation range from white in the lower elevations to dark blue in the higher elevations. After it was published by DOGAMI this image received quite a lot of media attention and has now been included in the map anthologies Map: Exploring the World and the first edition of the Atlas of Design. “This image seems to be half map, half painting; somewhere between science and art. It materialized one day while I was working on new ways of visualizing lidar data. I had recently discovered and found inspiration in Mississippi River maps from the 1944 Army Corps of Engineersʼ study, the Geological Investigation of the Alluvial Valley of the Lower Mississippi River, by Harold N. Fisk. These maps, I thought, stood alone as beautifully abstract works of art, yet they contained an immense body of scientific detail at the same time. Perhaps with these map images floating somewhere in the back of my mind, I searched for new cartographic ways of interpreting the streams of the Willamette Valley. I manipulated a digital elevation model of the Willamette River to display about a 50 foot elevation range, from low elevations (displayed in white) fading to higher elevations (displayed in dark blue). From the scientific perspective, this effect visually replaced the relatively flat landscape of the valley floor with vivid historical channels, showing the dynamic movements the river has made in recent millennia. From the artistic point of view, the map/painting took on a completely different quality, ranging from electrical storm to nervous system.